On Friday, May 1st, at 7pm, Céline Keating will launch her new novel, Play For Me at Book Culture on Columbus. A writer living in New York City, Keating's short fiction has been published in many literary magazines, including Appearances, Echoes, Emry’s Journal, The North Stone Review, Prairie Schooner, and the Santa Clara Review. Céline is an avid student of classical guitar and a regular contributor to Acoustic Guitar and Minor 7th magazines. Her articles have also appeared in Coastal Living, Guitar World, and Poets & Writers magazines. Her debut novel, Layla, was published in 2011. 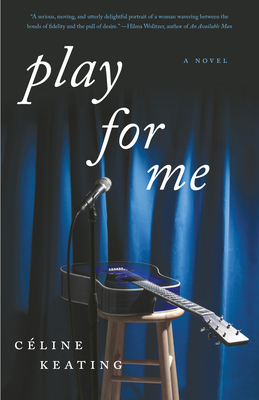 Her new novel, Play for Me is published by She Writes Press. How did you come to write Play for Me? In Play for Me, my main character, Lily, joins a touring folk-rock band, leaving her job and marriage in an attempt to find a second chance at life, passion, and art. The idea was sparked by performance train trip I took across Canada. I had rediscovered a love of guitar in midlife and begun doing music reviews. My plan was to write an article about the train tour, in which several bands performed or jammed pretty much nonstop. I was fascinated by the lives of the musicians and their shenanigans, and by the incredibly devoted fans who had come from around the world to be in close proximity to their idols. I combined that theme with what was going on for my sister, who was mired in empty nest angst. But essentially it's the power of music that inspired this story. I wanted to explore both what creates passions that border on obsession and also why, exactly, music has such power to move us. I’m reading a novel about a concert pianist, Appassionata, by Eva Hoffman. Mezmerizing. From childhood my personal favorite is Fair Bay, by Eleanor Frances Lattimore, which is set on an island in South Carolina. It was the first book that immersed me in an imaginary world and got me hooked on reading. As an adult and as a writer, my favorite has to be Proust’s Remembrance of Things Past – I am in awe of his writing. I enrolled in a course at the New School to read it, and it took me an entire exhilarating semester I which I read nothing except those 3,000 pages. I was so enraptured I feared I’d never be able to read any other writer. Happily that did not occur! Yes, I’m very eager to read Early Warning by Jane Smiley. I love novels with a strong sense of place, and have a particular fascination with farming life – probably because I’m a born and bred urban New Yorker. I’m working on two books, both related to Montauk. One is a new novel that is set in a tourist town very like Montauk. The second is an anthology I’m co-editing of Montauk-themed fiction, poetry, and prose.